To local attorney W. Chester Maple, the letter he received in 1903 seemed a simple and wonderful matter. Philanthropist Andrew Carnegie was offering Lebanon $10,000 for the construction of a public library providing the city could donate an acceptable site and agree to maintenance costs of $1,000 per year. Carnegie’s generous gift would in time prove difficult to accept. Scottish immigrant Andrew Carnegie had amassed a fortune throughout the 19th century and spent the latter years of his life giving most of it away. “A man who dies rich dies disgraced,” Carnegie once told the press. The former owner and president of U.S. Steel spent a lifetime creating and building libraries in small towns throughout the United States. And suddenly in 1903, Lebanon was to become the home of a Carnegie Library. Lebanon Town Council quickly adopted a resolution establishing a “free and public library and reading room for use of inhabitants of the village.” By a vote of over two-thirds, citizens accepted Carnegie’s generous offer. A one-mill tax on all property, real and personal, was levied to pay for support and maintenance of the new library. The site of the proposed library was to be one of the three remaining public corners at the intersection of Main and Broadway. By a public vote, the southwest corner of Main and Broadway was deemed to be the most suitable location. Despite overwhelming public acceptance of the Carnegie Library, lawsuits were filed to prevent construction. The case, which occupied three years, worked its way slowly all the way to the Ohio Supreme Court before a decision was reached in 1906 freeing Lebanon to begin construction. By this time, construction costs had exceeded Carnegie’s initial $10,000 donation. Former Lebanon resident and philanthropist William E. Harmon agreed to donate an additional $3,500 for construction and the purchase of materials. As Lebanon has grown, so has the library. In 1940, use of the library was extended to all residents of Warren County. A bookmobile service was established in 1943 broadening the library’s reach to schools and villages outside of Lebanon. In 1955, the basement was renovated for additional space and a large addition was built in the 1980’s. An expanded children’s section and a summer reading program are ever-present examples of the library’s dedication to the youth of Warren County and to improving the literacy of young people. Andrew Carnegie’s generous donation in 1903 helped create both a historic and educational landmark in Lebanon. Generations of citizens, both young and old, have climbed the broad steps and walked through those big double doors in search of knowledge, education, and entertainment. Whether it be research for a term paper, the latest fiction thriller, or perhaps just to spend a few quiet moments reading a newspaper, Lebanon’s Carnegie library continues to enrich the lives not only of Lebanon’s citizens but those of Warren County as well. The beginning of Bookmobile service in Warren County in March of 1943. Librarian Geraldine Noble and driver C.W. Kinner wait while a patron peruses a selection. The Summer Reading Program has been a favorite of Lebanon children for decades. In 1987 a 20-foot wall collapsed during work on the expansion. No one was injured. 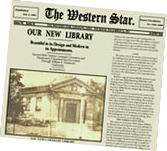 OUR NEW LIBRARY was the headline of the Western Star Thursday, December 26, 1907. Two-thirds of a two-story rear wall collapsed. Librarian Raymond J. Nienaber stands in front of the remodeled public library in Lebanon. 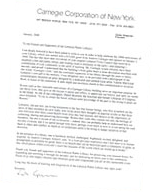 Letter from the Carnegie Corporation of New York, 2008.